The Best Wedding Attires we spotted on celebs in Lakme Fashion Week 2018! Recently, Kareena Kapoor Khan closed for the grand finale of Lakme Fashion Week, wearing a jazzy cocktail gown and stole a thousand hearts! This also marked the end of Lakme Fashion Week Autumn Winter 2018 which gave us some major fashion inspo! Jayanti Reddy’s winter festive collection called 'N O O R' was a sight to behold. She dedicated her collection to the Noor that resides in each of us. “We imagine Noor to not just be fascinated with the natural world, but bring it into her very life. We interpret this with the bewitching, bold flowers and foliage that creep into our designs,” says the designer. What I love about it: The new-age salwar kurtas which are so mehendi and haldi ready, the colour pallete of the whole collection and the offbeat and stunning blouses with breathtaking necklines will be something totally refreshing for bridal wear options. Jahnvi Kapoor looked jaw-droppingly gorgeous in this floral printed lehenga by Nachiket Barve who presented his collection 'Millenial Maharani’ this season. According to him- a wedding will just need clothes to be dazzling and not jewellry! I say win win! The collection takes inspiration from the globe trotting Indian Royalty of the 20’s and 30’s; looking at the lifestyle of jet setting millennial bride squads, for weddings sprawled across the globe. Gaurav Katta presented his collection ‘The souvenir of british india’ and it was phenomenal. He says, “ our collection is about Independence, Elegance & Empowerment elaborating the Shades of 16th Century of the Indian British royalty”. What I love about it: The colour-palette - which is so subtle and understated. You can pair a statement jewelry with some really dramatic makeup and slay your wedding day like a queen! Also, the use of jackets over gowns, giving it a touch of true royalty. Monisha Jaising, who is synonymous with cocktail couture and resort, showcased the collection ‘Shades of a Diva’. It’s makeup range that draws from the different moods of Kareena Kapoor Khan herself. Although, take inspiration from the dresses, they are exactly what you need for your cocktail or sangeet night! 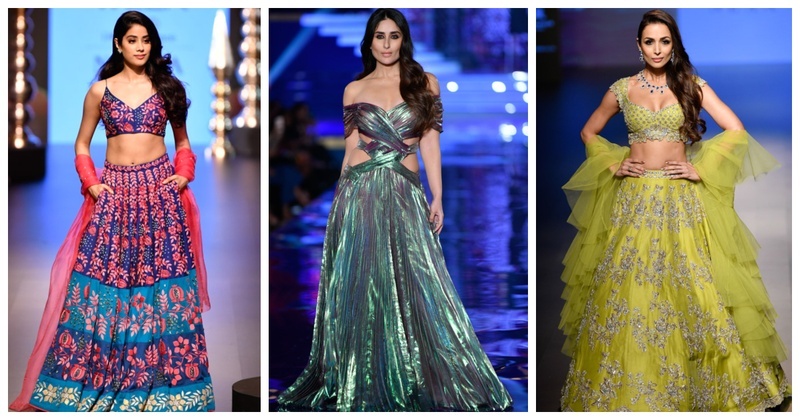 What I love about it: The beaded and taffeta gowns, the sari hybrids in solid hues and Kareena Kapoor Khan gown! That holographic pleated number is a vision to behold. What I love about it: The prints of course and along with that the plunging necklines and the use of such subtle colors! It’s a totally mehendi-haldi-reception ready option. What I love about it: The shaadi-ready colours for a modern bride and the use of ruffles and bling which gives the whole collection a princess-ey vibe! Also, the ruffled sarees in the whole collection are just ah-mazing. What I love about it: The off-beat, yet classy lehenga colors, the subtle use of bling and the breathtaking front and back blouse designs! So, is your wedding wardrobe sorted?